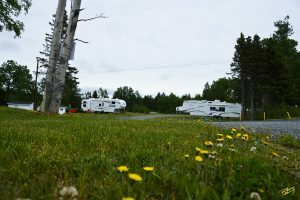 The Harold W. Duffett Shriners RV Park is a family friendly, modern, full service RV Park located on the Eastport Peninsula, one of Newfoundland’s most beautiful destinations. We offer a range of services and facilities to accommodate all sizes and styles of RV’s. Opened in 1972, the park is owned and operated by Mazol Shriners of Newfoundland and Labrador — but open to anyone and everyone to enjoy! The park consists of 147 sites. The park has a Recreation Centre which is open to park patrons for cards, dances, musical jam sessions and many other activities. The centre also houses an athletic fitness centre. We are proud of the fact that the park has been rated as a 3.5 Star Facility by Canada Select, and as a 5 Star Facility by Good Sams.